PRODUCT DESCRIPTION: Plant growth regulator which is sprayed out over plant beds where you desire to slow the growth of existing plants. This product will not kill the plant but instead keeps it from growing too fast or out of control which in turn will help to minimize food demands and general maintenance like cutting or trimming. 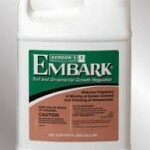 WHERE TO USE IT: Lawns, mulch islands, pine isles, flower beds, fence rows, roadsides, in ground cover and along any stretch of land where you need sustained plant growth to help minimize natural erosion but where the current rate of growth is maybe too fast and needs to be throttled down just a bit. Embark can accomplish that exact goal. 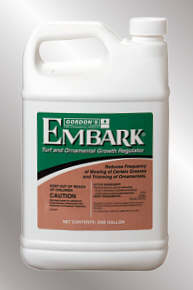 RATE OF APPLICATION: 2-4 oz per gallon per 1000 sq/ft. Use it 1-2 per year depending on the plant or plants being targeted as well as the region where this material is being used. Warmer climates tend to have longer growing seasons which could mean more applications will be needed.